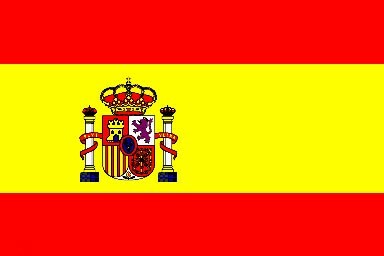 The research team of the Fluid Mechanics Divisions of the University of Jaén and the Polytechnic University of Cartagena started to work on fire engineering in 2002. The research is focused on the experimental and numerical study of atrium fires. 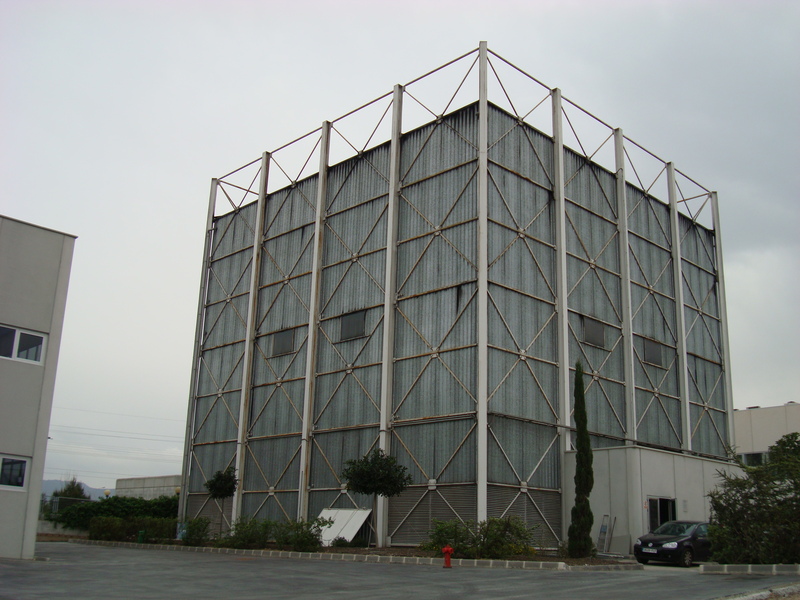 Experimentally, several full-scale fire tests have been performed in the Atrium of the Centro Tecnológico del Metal of Murcia, Spain, figure 1. This facility consists of a prismatic structure of 19.5 m x 19.5 m x 17.5 m and a pyramidal roof raised 2.5 m at the centre. 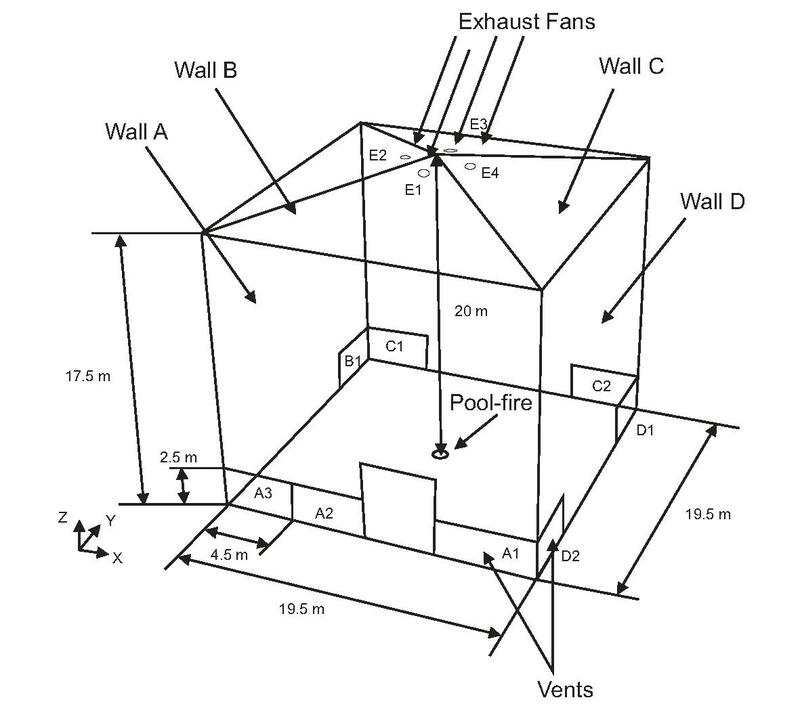 There are four exhaust fans installed on the roof and eight grilled vents arranged at the lower parts of the walls with no symmetric layout, figure 2. Each vent has dimensions of 4.88 m x 2.5 m.
For the tests, heptane pool-fires have been placed at the centre of the floor. Fire powers ranging from 1 MW to 7 MW have been tested. In addition, the venting conditions respect to the smoke exhaust and the inlet air have been tested. Thus, natural ventilation, mechanical ventilation and the combination of both have been tested. The inlet air area at the vents has been also varied. Thus, all the vents open, vents 100 % open with symmetric layout and vents 22 % open with symmetric layout, have been tested. Numerically, the use of numerical commercial codes (Phoenics and Fluent) to simulate these kinds of fires as well as their validation has been first aimed . Later, this has been extended to other codes such as FDS  or OpenFOAM. The study of different venting strategies on the look for more safe, efficient and economic designs is also considered. Figure 1. Test facility, in a. Layout and main dimensions of the Fire Atrium, in b. The future objectives of research are on the study of the smoke detectors and sprinklers efficiency for this kind of facilities as well as on the effect of the make-up air. For this aim, again both methodologies, full-scale experiments and CFD numerical simulations, will be used to address with this subject. This research team collaborates with members of the BRE Centre for Fire Safety Engineering of the University of Edinburgh since 2007.